A trip to the grocery store is a solid guarantee you’ll meet your daily quota of cow sightings, especially if you spend even just a few seconds in the dairy department, glancing at milk cartons and yogurt cups. 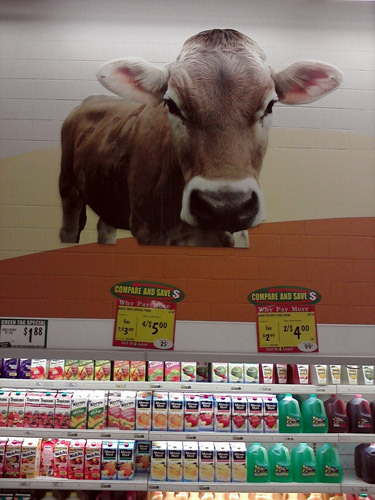 During a quick run earlier today to my local grocery store to get some ice cream, I took a few pictures of the cow of the day. I’m used to seeing cow images but I think the one below tops them all. As you leave the store, you can’t help but notice the claw crane machines, especially if you’re in the company of children, as I was today. 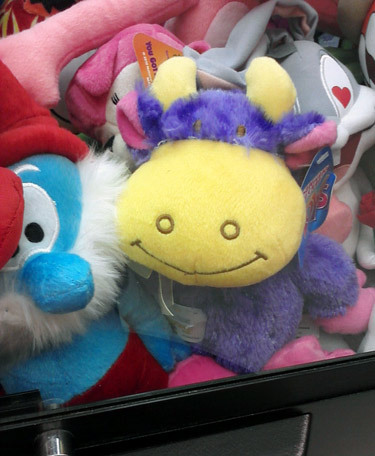 If you don’t want to see cows, stay away from claw machines because it’s a great place to spot them, and those cows are not the most good-looking ones! Hmm, it’s a cow. No, it’s a gremlin, maybe… Actually, I’m still not sure what it is. I love how it’s sitting right next to the spotted dog. Maybe they think they’re related? I guess it’s what you call a purple cow (if you a fan of the marketing guru Seth Godin, you’ll understand the analogy and want to check out Seth Godin’s Purple Cow book if you haven’t read it yet). I think Papa Smurf is keeping it good company. 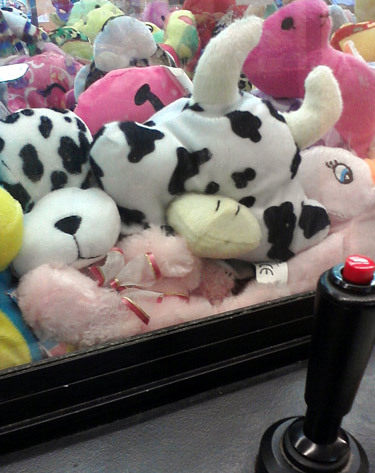 Of course my kids asked me if I’d be kind enough to give them some money so they could “free” the cows from the claw machines. Nice try, but I just blog about cows, I don’t save them. Previous Post Today’s cow is a pig… in a cow costume! Photo Three: God knows what. I’ve boldly entered a world I didn’t know existed. Thanks. I think. Haha, from now on you’ll notice every cow you see every day. And trust me, there are plenty. You could probably start in your fridge. Yup. One cow. The Laughing kind. I like The Laughing Cow. Did you know it’s French? La vache qui rit! I loved it as a kid.